Half a year ago I wrote a long post discussing “the real cost of shelter,” by which I meant not just the downpayment on a house, but the monthly carrying cost for a mortgage, and comparing both of those with median rent. That comparison showed that, while the “real” cost of a house downpayment was at a new high, the “real” cost of median asking rent was even higher. By contrast, the monthly carrying cost of a mortgage was quite moderate. This meant that, if a buyer could find a way to put together a downpayment, home-owning was a bargain compared to renting. As I’ll show below, six months of price and interest rate increases later, there is even more stress on both homebuyers and renters. By way of a quick recap, I wrote six months ago that I had never seen a discussion of the relationship between the relative cost of homeownership vs. renting, particularly as a function of the household budget. The choice (or ability) to live in the residence one desires isn’t a matter of its cost by itself, but also the relative cost of the type of residence. What is the cost of a house compared with the cost of an apartment? How expensive are each of them compared with a household’s income? If both are too expensive, maybe the choice is made to live with mom and dad as an extended family. 1. the “real cost” of a downpayment on a house. 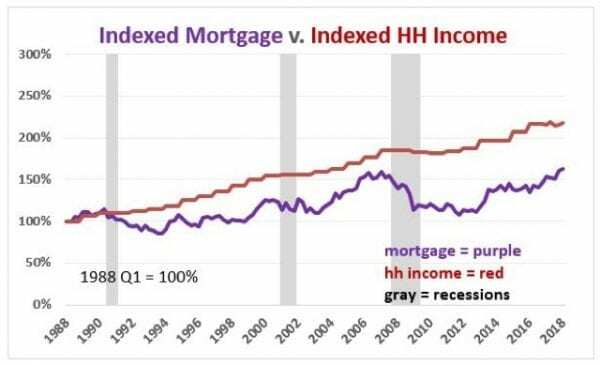 In order to generate the “real cost” of buying a house, the best way is to compare the median household income with the median house price. If that pace continues, by this summer the median price will be about $280,000, 22% above the bubble peak. 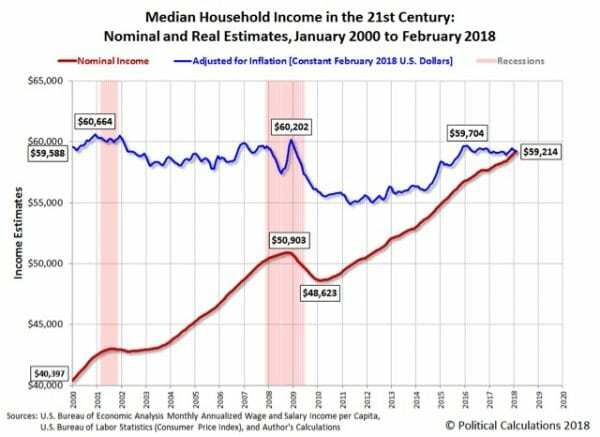 Since nominal median household income has increased about 25% over that same period of time, they will be only aabout $7500, or about 3% below their “real” bubble peak. So, why haven’t home sales rolled over? Part of the reason is the demographic tailwind I discussed last week. Because Millennials of peak first-home-buying age now number about 15% more than the Gen Xers of 2005, a build-up that has grown year after year for the last decade, it presumably takes even more financial stress to overcome that tailwind. 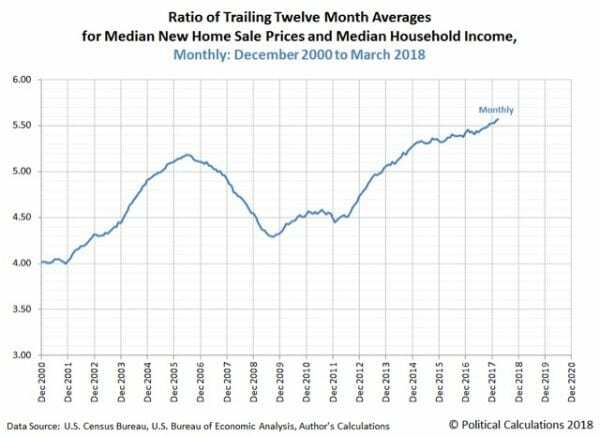 But there are two other reasons why home sales haven’t turned negative yet: the relative (un)attactiveness of renting, and the monthly carrying cost of mortgage payments. Let’s look at each of them in turn. 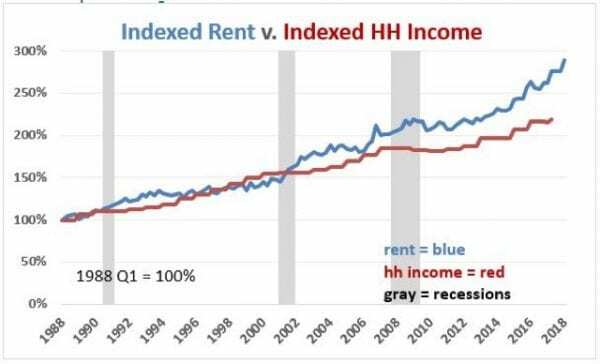 If house prices have risen to new highs several times since the turn of the Millennium, so have apartment rents — almost relentlessly. In percentage terms, in 1988, the median rent for an apartment was 14.5% of median household income. That rose to slightly over 16% in the mid 1990s before falling to the series’ low of 13.7% in 2000. It had risen to a record 18.4% of median household income in the 2nd quarter of 2017, the last available data when I first published this piece. 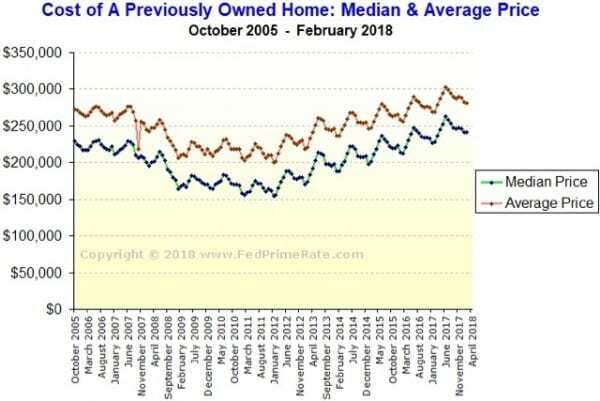 Last year, when I first posted this metric, the monthly payment for the median house wasn’t extreme at all, but rather very moderate in terms of the long term range. By comparing the “real” cost of housing to renting, both in terms of down payments and monthly mortgage payments, we can make sense of some of the biggest trends in the market for shelter. That being said, with increasing financial stress showing up across the board in the costs of both buying and renting, we can only expect to see even more involuntary extended family households and involuntary unrelated housemates. Further, *if* interest rates and housing costs increase much further — most importantly, if home builders continue to focus on only the most expensive segment of the market — at some point they will overwhelm the increased numbers of home-buying age Millennials who have been buoying up the market. 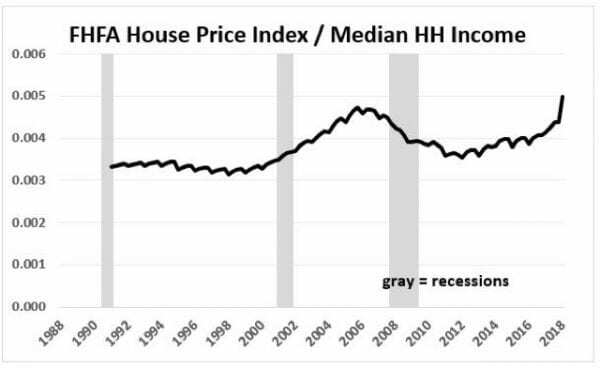 Sales will turn down, followed by home values, leading to another deflationary bust. Sound like what Trump was doing. Assets appreciate so you borrow more money to pay debt until the assets do not appreciate and you declare bankruptcy. And we have the record student loan indebtedness. I think this will be a factor as to how quickly if at all a person can get up the funds for the home buying deposit. Being that we are doing nothing to change the way one pays for college, I think in time it will be a factor toward fewer buying homes, as it seems we are definitely at time going forward that college ed is needed to get to an income that would possibly allow savings for a deposit. Though I have shown here some years ago that we have raised the cost of being 1950’s/60’s middle class to where 2 people working with bachelor’s starting pay is below that level. Most of the people I talk to on student loan debt, do not give a damn about them and believe they should have known better. It is the old I did it, you can also. Middle Class is certainly not Median Income. It has moved upwards from the Median. There must be a supply demand imbalance. They are building houses and apartments like crazy, I mean the returns are obviously there. Is the population growing faster than that? For all these years? Maybe just on the coasts? Where does this come from? Has FHA suddenly increased their down payment requirements? With decent credit is is 3.5%, and if the loan officer knows anything at all, most of the closing costs can be rolled into the loan simply by using the seller’s 6% assistance levels. 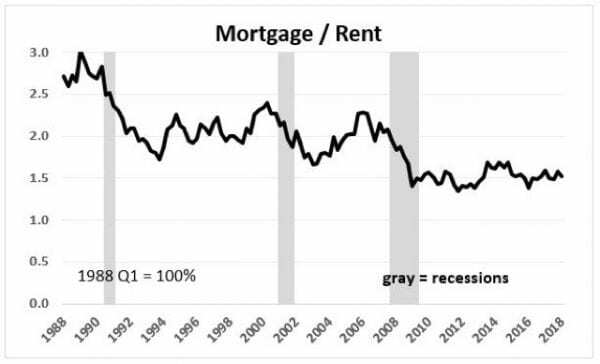 Personally, I think the reduction of that level from 10% was a big mistake and does hurt buyer’s, I do not get this “record down payment” thing. One other thing, looking at interest rates during the bubble does not make a lot of sense considering the amount of arms during that period unless that is taken into account. BTW, I would suggest a fold. The length of the post makes it a pain to post. I see no such thing as high down payments needed to buy a home, particularly in the case of first time buyers. To your point, rent is a an approximation of cost over time as qualified by the amount of competition in the area in which the home or apartment is located.